…as Colorado’s drought intensifies and the state grows desperate to increase snowpack, a new study is helping create buzz around cloud seeding. And for the first time, Colorado is stepping up its game and plans to try cloud seeding not just from generators on the ground, but by airplane. Cloud seeding, or weather modification, is mentioned multiple times in the Colorado Water Plan. And a drought contingency plan approved this month by half of the seven states that make up the Colorado River Basin coalition includes three key components: reducing water consumption, managing reservoirs and “augmenting” the water supply through cloud seeding and removal of water-sucking tamarisk, or salt cedar trees. “By itself, cloud seeding is not a drought buster, but it is one proven method to use along with demand management and reservoir operations,” said Dave Kanzer, deputy chief engineer for the Colorado River District, based in Glenwood Springs. A breakthrough study of cloud seeding by aircraft involving University of Colorado and University of Wyoming researchers took place in 2017 in the mountains of southwest Idaho. It captured attention after its results were published this year in the Proceedings of the National Academy of Sciences. 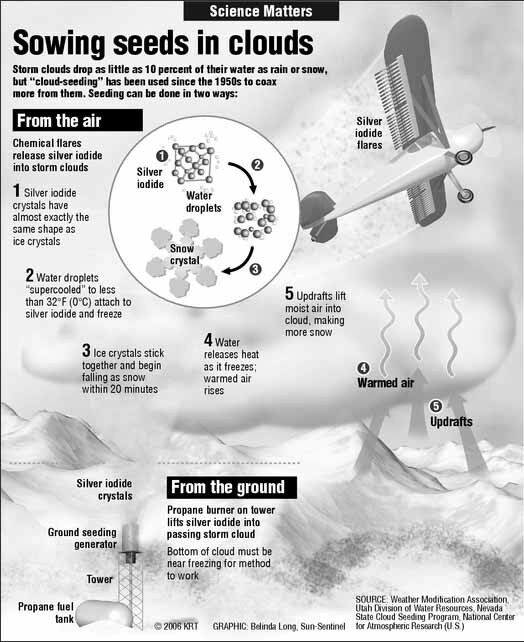 For the first time, researchers — in a second aircraft flying near the cloud-seeding plane — could see silver iodide enter the clouds and form snow crystals. In the experiment, funded by the National Science Foundation with support from Idaho Power Co., the cloud-seeding airplane passed through the clouds dropping flares of silver iodide, a compound that attaches to water molecules and forms crystals. The turboprop soaring above the Payette Basin also flared silver iodide from its wings as it flew through clouds rich with supercooled water droplets, ripe for seeding. The research plane flew near the seeded clouds and was able to record via radar that silver iodide caused the water molecules in the clouds to freeze. The researchers’ radar detected water molecules inside clouds becoming “glaciated” and growing heavier after they were seeded with silver iodide, forming snow. Now that they’ve proved cloud seeding works, follow-up work is needed to determine how much snow it actually produces and whether it’s an efficient way to increase snowpack, Friedrich said. Cloud seeding in Colorado is a $1.2 million annual operation, and according to the best estimates of researchers, can increase snowfall anywhere from 2 to 15 percent per storm…A turboprop plane, a King Air C90 owned by Weather Modification International, recently began seeding clouds in southern Wyoming. Now the North Dakota-based company is working with Jackson County, Colorado, on plans to boost snowfall in the lower Medicine Bow Range northwest of Fort Collins. Snowpack from that mountain range ends up in the headwaters of the North Platte River and Walden Reservoir, northeast of Steamboat Springs. Jackson County water officials have filed permits for the project with the state Department of Natural Resources and final approval is only a matter of paperwork..